Parallel Lines requires one to two days for installation, with one technical assistant. 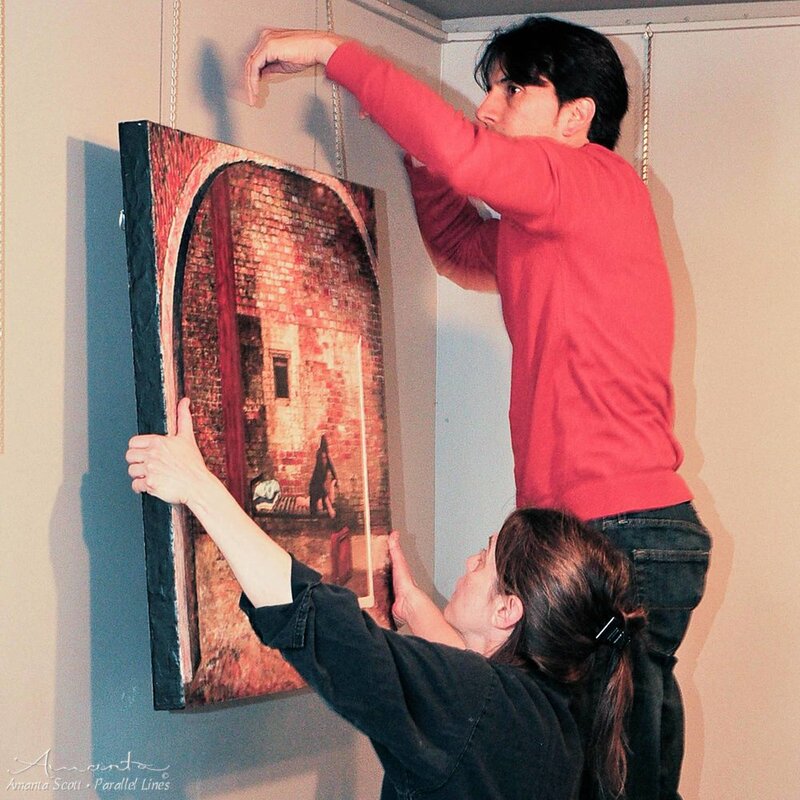 The Artist is available to facilitate the installation. The paintings presently travel in individual padded cardboard boxes lined with archival paper. Painted with beeswax and microcrystalline wax on birch panels, the paintings are mounted with D-rings for hanging on picture hooks. Currently there are 21 paintings in the series; 5 are in private collections. New works are in progress. Encaustic is a wax medium and requires careful handling. The paintings must not be exposed to extreme heat or cold. They can melt if left in a non-airconditioned vehicle for any length of time. They can also crack if exposed to freezing temperatures. Each bed measures 30” wide x 88” long x 28” inches high (6’6”ft x 2’5” ft). A total of 18 beds are available. 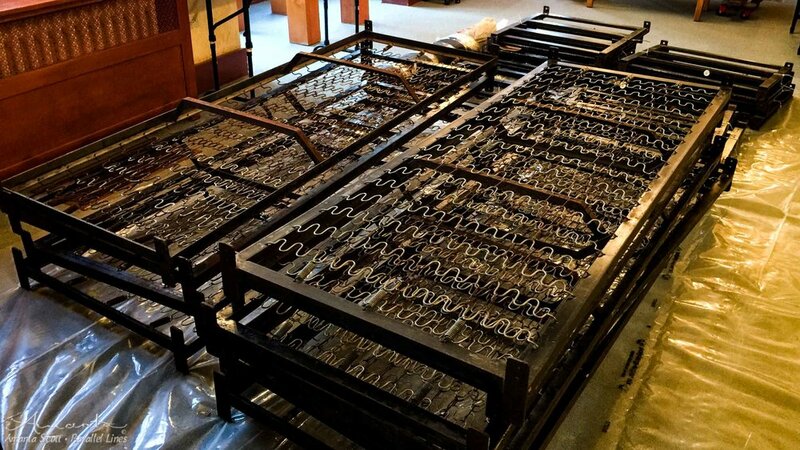 Each prison bed is comprised of 3 pieces: one flat main frame, and two end pieces which bolt onto the main frame to create the headboard and footboard supports. During transportation, the prison beds stack back to back, then front to front, to minimize space consumption. The bed ends are packaged with the head and foot together in sets. The eggshells are packed in large plastic bins. Partnership with locals is recommended as the eggshell path will require augmenting and maintenance due to enthusiastic Visitors trampling across the shells. The black rubber underlay travels as a roll 35+ ft long, weighing approximately 60 lbs. Perceptions - painting series — includes 21 paintings of which 19 are presently available for touring. 15 Minutes of Fame — includes one prison bed, pillow and blanket, and one orange suitcase filled with assorted personal items. In Memoriam — includes up to 18 prison beds (configured in rows). Fragile — includes 120+ dozen eggshells (sanitized); a protective floor runner; and disposable shoe covers for Visitors walking in sock or bare feet upon the eggshells. Esperanza — includes one prison bed adorned with keys donated from Visitors to previous installations. A basket of spare keys and blank tags is also provided should Visitors arrive without a key, wishing to add one to the installation. 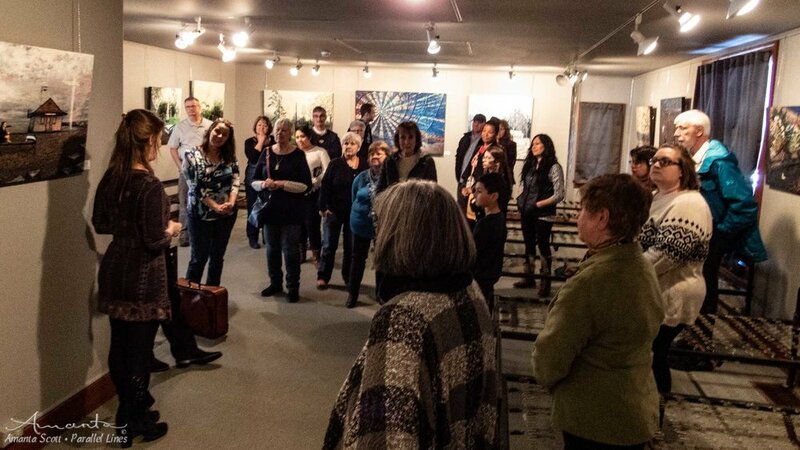 As Artist-in-Residence during the run of the exhibition, Amanta performs; interacts with Visitors (motivating them to interact with the installations and create their own installations); facilitates discussion and Sharing Circles; records video testimonials; conducts Artist Talks and walk- throughs; and directs workshops — at the galleries and/or in the community. For large groups, an Assistant/Docent can be helpful: to return the installation to its original state (i.e. : objects in suitcase, blanket folded) in preparation for subsequent Visitors while the Artist facilitates discussion between onlookers and the participating Visitor; and to document Visitors’ installations and interaction sessions through video and photography. PLEASE NOTE: While aiming to create a safe, playful space for conversation, intercultural understanding and healing — we must also recognize the risk of unearthing past trauma and pain. For this reason collaboration with mental health support workers in each region may be helpful.